The 42PW450T 3D Ready TV from LG provides stunning picture quality and a striking razor frame design, allowing you to bring the magic of 3D home and convert your living room to a sports stadium or cinema thanks to its crystal clear picture quality. The PW4 series is HD Ready with built-in Freeview HD and 600Hz technology to provide a superb viewing experience. The LG 42PW450T Plasma TV provides you with a superb large screen cinematic experience with faster response times and deeper blacks than LCD and LED TVs - perfect for watching fast action sports and movies. The LG 42PW450T brings the ultimate immersive viewing experience into your living room, with sports, videogames, documentaries and blockbuster movies bursting out of the screen. With this television, you can experience the same breathtaking 3D effects that you’ve seen in the cinema in the comfort of your own sofa. You can convert your living room to a sports stadium or cinema with content from 3D Blu-ray, games consoles and Sky 3D. The set includes one pair of active shutter 3D glasses, further pairs available separately. You can even convert your regular television programmes into immersive 3D with 2D to 3D conversion. The converted images are available in twenty different scales of 3D effects to personalise your 3D experience. The LG 42PW450T’s razor frame design provides one of the slimmest frames available today, offering an enhanced viewing experience due to a bigger screen to frame ratio, and saving you space in your home at the same time. 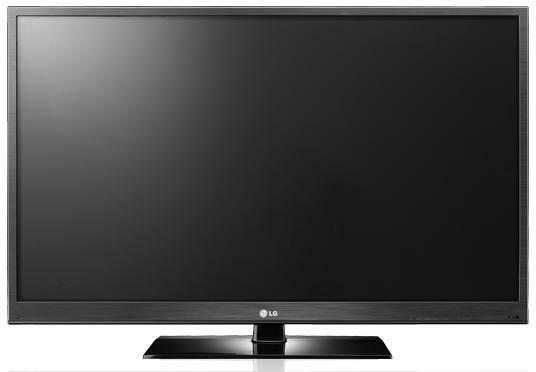 This LG 600Hz plasma TV provides zero motion blur and the ultimate razor sharp response time, perfect for watching high speed sports and movies. Get Ready to watch High Definition TV for free with built in freeview HD bringing you the best of BBC, ITV and C4 in glorious high definition with no monthly fee or contract. Freeview HD provides up to 5 times the picture quality of standard definition freeview taking you closer to the action.